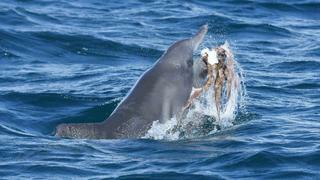 Is this dolphin ‘playing’ with an octopus? 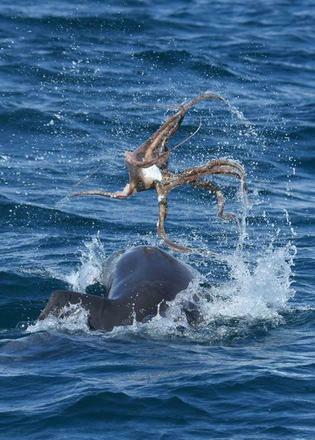 Incredible photos have emerged of a dolphin playfully tossing an octopus in the air in Western Australia. Murdoch University PhD student Krista Nicholson captured the pictures while she was conducting research near Mandurah last moth (February 20). Nicholson told local press that it was an extremely rare event to have been caught on camera. "I've been studying dolphins for five to six years and never seen a dolphin play with an octopus for five minutes," Nicholson added. "There are records of dolphins playing with octopuses in Bunbury and other parts of the world, but only maybe once in Mandurah. "It was absolutely spectacular to watch. It would let it float for a while, then come back and grab it by a tentacle and throw it into the air." But is the dolphin really “playing” with the octopus or is this actually something more sinister? The answer is still open for debate due to a lack of research. "There is no consensus as to whether the dolphins are playing, because no one has really studied it," she said. "But this dolphin looked pretty happy so there is the assumption they are playing. And a dolphin was washed up with an octopus coming out of its month, so there is an assumption they do eat them." Nicholson is part of the Mandurah Dolphin Research Project, which started a new research programme in January to understand more about bottlenose dolphins using the Peel-Harvey and adjacent coastal waters in Western Australia. It is hoped that the information will help to protect estuarine and coastal dolphin populations from the impacts of coastal developments. If you enjoyed these pictures don’t miss photos of sea turtles wearing swimsuits for scientific research or the video of killer whales playing with a yacht in New Zealand.